A company is defined as the smallest unit for which financial statements can be created in accordance with commercial legal regulations. 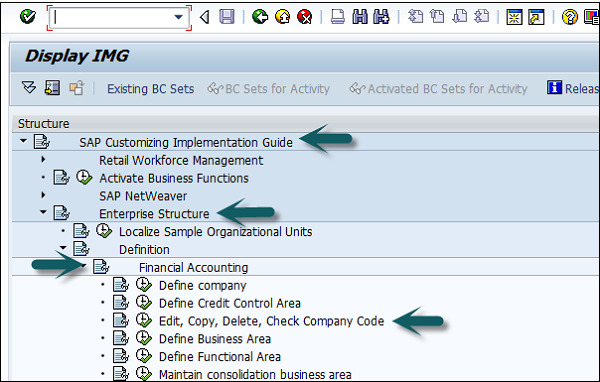 In SAP FI, a company can comprise of multiple codes, however it acts as a single unit for which financial statements are available. All the company codes must use the same chart of accounts list and fiscal year, however each code can have a different local currency. A chart of accounts list consists of all the chart of accounts that can be used and each code must have one chart of account. A fiscal year normally consists of twelve months’ time period where company creates the financial statements. Use T-code SPRO → click on SAP Reference IMG → New window will open. 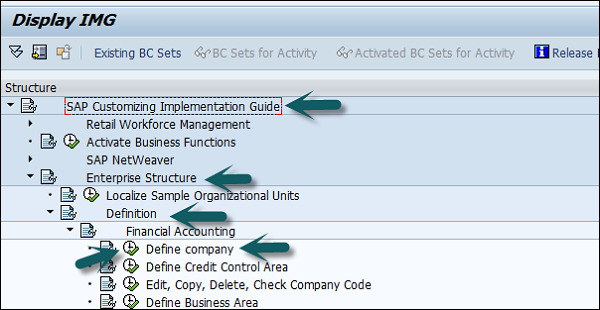 Expand SAP Customizing implementation guide → Enterprise Structure → Definition → Finance Accounting → Define Company → click on Execute (see the pointer in the screenshot). Enter the company code to represents group of company. Enter the full address-street, PO Box, postal code, city. 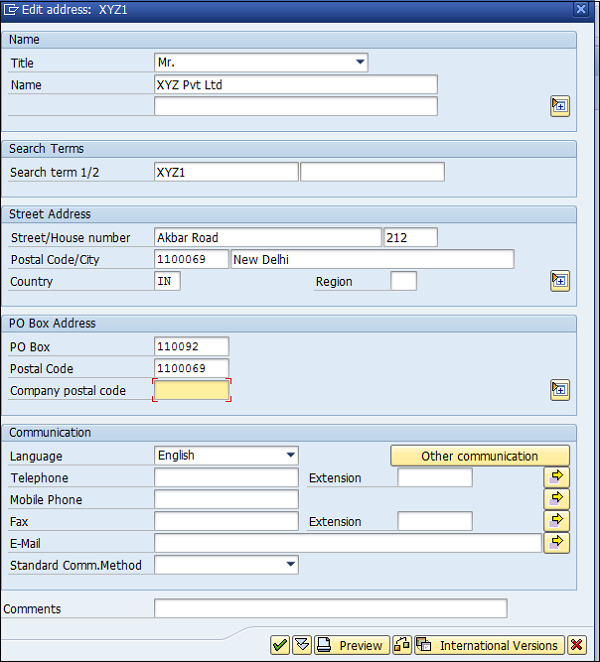 The next step is to save the company details → CTRL+S or as shown in the above screenshot. In SAP FI, a company can comprise of multiple codes, however it acts as a single unit for which financial statements are available. Company code is the smallest unit in an organization for which financial statements (profit-loss statement, etc.) can be generated. Let us discuss how to create, edit, and delete a company code. Take a look at the following screenshot. Expand Enterprise Structure as mentioned in the previous topic → Definition → Financial Accounting → Edit, Copy, Delete, check company code → Execute using click on the watch image → New window will open → You can create a new company code by selecting both the options. Select Edit, Copy, Delete, and Check Company Code. 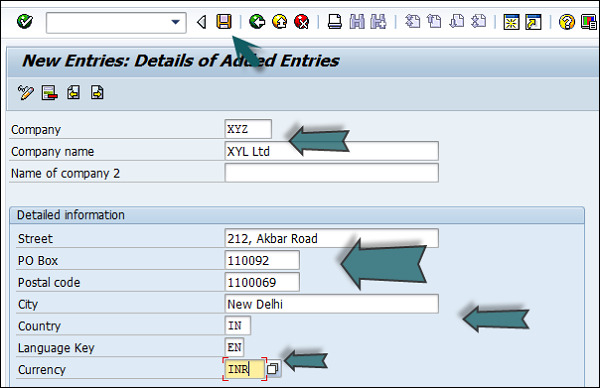 It allows you to copy all the configurations and tables automatically. If you select Edit company code, you will get the following window → click on New Entries and update the code details. You can click on the Address button and update the following fields. Once the Address field is updated, click the Save button. Business Areas are used to differentiate transactions that come from different lines of business in a company. There is a big company XYZ which runs multiple businesses. Let us assume it has three different domains like manufacturing, marketing, and sales. First is to create different company codes. And the other better option is to create each of these business lines into the business areas. It is easy to configure if you use a Business Area, as you just need to attach to the company code and the other details in that business area will get attached automatically. By using Business Areas in controlling, you can create Profit and Loss statement, Balance Sheet, etc. for business areas. Hence it is used for management accounting in a few companies. Note − Business areas are used more in Controlling as compared to Finance Accounting. 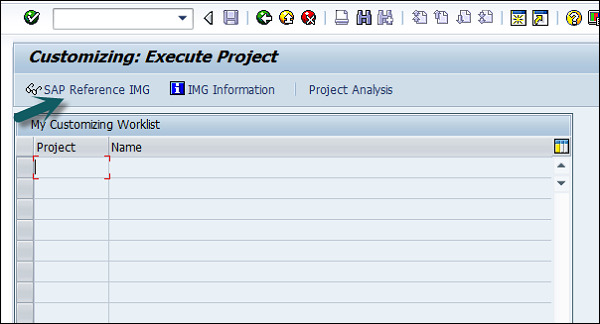 How to create a new Business Area in SAP FI? 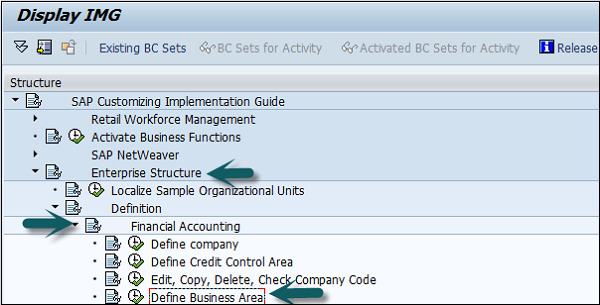 Expand Enterprise Structure as mentioned in the previous topic → Definition → Financial Accounting → Define Business Area → Execute → Go to New Entries. Enter the 4 digit Business Area code and save the configuration.